The Brick Meeting House (built as a Baptist Church) of Westford was constructed in 1822 and is the oldest church building in town. 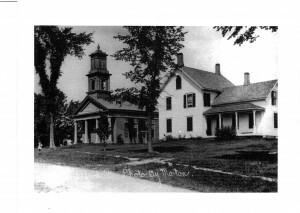 It is located at one end of the village green and has been a landmark for almost 175 years. In recent years, only basic maintenance has been done to the building but now it requires further action to maintain structural integrity. What is not readily apparent from a casual view is the extent to which there has been substantial deterioration of the structure. A beam will need to be added over the corner entry, and modifications to make the building accessible will include a new bathroom. The plans include the addition of a full service kitchen which will be regularly used for community dinners, receptions and small group functions. In November 1994 a committee was formed to begin exploring the possibility of renovating and restoring the building. 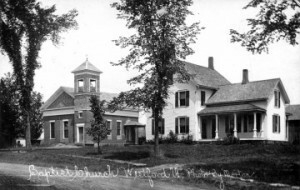 This group is now known as the Brick Meeting House Society and has become a subcommittee of the Westford Historical Society. Their goal is to restore the building as a town landmark and community center. In July 1996 the Brick Meeting House Society was awarded a State of Vermont Planning Grant in the amount of $11,200.00. In 1996 the group also held an Ice Cream Social and Band Concert as well as a letter fundraising campaign which was very successful. Other fundraising efforts and grant applications will all be a part of the ongoing process of restoring the Brick Meeting House building. Once renovated, The Brick Meeting House in Westford will be a community center serving all ages in the Westford area. Thus, we will preserve a secular facility, a local treasure located on the increasingly beautiful Town Common. Any voluntary contributions to help with the restoration of this fine building would be appreciated. Please contact John Doane at 879-3091 or 879-3022 if you have any questions in connection with this project. Contributions may be sent directly to the Brick Meeting House Society of Westford, P.O. Box 63, Westford, VT 05494-0201. The Brick Meeting House Society of Westford has 501c(3) status which will allow you to gain a tax benefit as a result of any contribution.